The German Ocean examines archaeological and historical evidence for the development of economies and societies around the North Sea from the beginning of the twelfth century until the mid sixteenth century. It draws in material from Scandinavia to Normandy and from Scotland to the Thames estuary. While largely concerned with the North Sea littoral, when necessary it takes account of adjacent areas such as the Baltic or inland hinterlands. The North Sea is often perceived as a great divide, divorcing the British Isles from continental Europe. In cultural terms, however, it has always acted more as a lake, supporting communities around its fringes which have frequently had much in common. This is especially true of the medieval period when trade links, fostered in the two centuries prior to 1100, expanded in the 12th and 13th centuries to ensure the development of maritime societies whose material culture was often more remarkable for its similarity across distance than for its diversity. Geography, access to raw materials and political expediency could nevertheless combine to provide distinctive regional variations. Economies developed more rapidly in some areas than others; local solutions to problems produced urban and rural environments of different aspect; the growth, and sometimes decline, of towns and ports was often dictated by local as much as wider factors. This book explores evidence for this ‘diverse commonality’ through the historic environment of the North Sea region with the intention that it will be of interest not only to historians and archaeologists but to those who live and work within the historic environment. This environment is a common European resource with much to contribute to a sustainable future – the book provides an archaeological contribution to the understanding of that resource. The German Ocean is a tour-de-magnum-force. The book is a real eye-opener with a mass of interconnected data set in context. 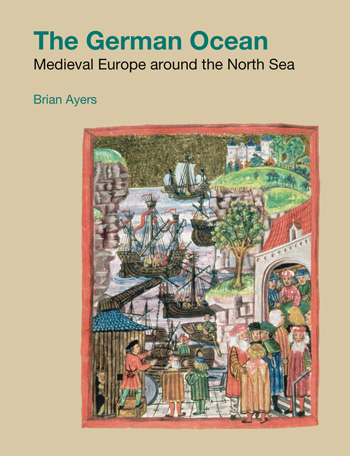 This book is a magnificent analysis of archaeological contributions to an understanding of the impact of human interaction across the North Sea region over a period of five hundred years. It is a 'must-have'. For those working with or interested in British medieval archaeology, this book is invaluable for introducing new ideas and providing signposts to exciting new research being carried out both at home and abroad. Elegantly written and full of extraordinary detail, it draws upon a huge amount of major archaeological excavations. Ayers' story fascinates in its sweep and detail. The breadth of its vision is astonishing. Even the best informed archaeologist will find a new building or excavation among its pages or in its vast bibliography. It reveals, in particular, the riches of archaeology in the medieval towns of the Netherlands and northern Germany, as well as eastern England, all illustrated with numerous colour pictures. It is a great pleasure to welcome this most recent addition to the Studies in Medieval Archaeology series, through which Ayers’ life-long passion and erudition shine through. This marvellous book is a definitive text that is all the more significant because the subject, the interconnectedness of the nations around the German Ocean, although of the greatest importance, has not previously been covered in any depth. Packed with archaeological evidence, very fully referenced and clearly illustrated, the book is an essential source for any researcher, field archaeologist or historian working on the medieval period from the western coast of Russia to the English Channel. The scope of this volume will ensure a broad readership who will no doubt be delighted by the high production values of this full colour edition and Ayer's lucid, engaging prose. Archaeologists concerned with maritimerelated sites in the region, whether at landscape level or a single boat-find, will find it an invaluable guide to setting their work into context. And historians whose areas of interest border on the North Sea will find information here that does not figure in documentary sources, but which can be integrated with them to advantage.